Here it is – finally! My newest macaron experiment, this time with a flower theme. 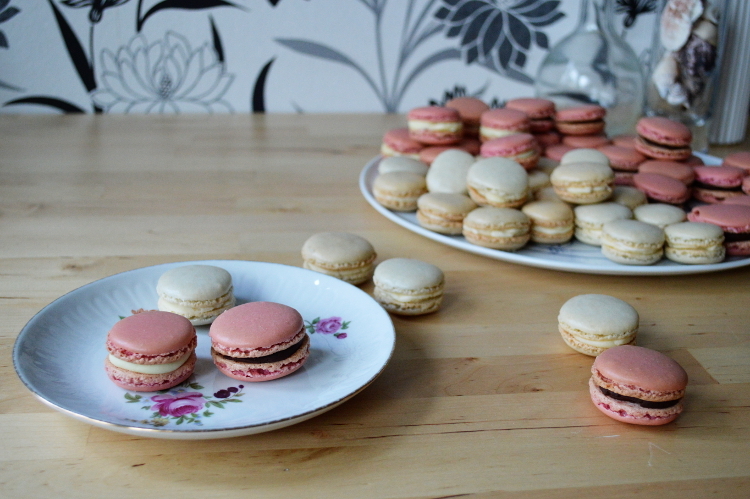 I don’t understand why making macarons is so addictive, but there is just something there. Maybe it’s the endless possibilities with the fillings combined with the adorable and chic looks? This time I also wanted to experiment with two different types of recipes. I had preferred a recipe that used almost equal amounts of almond flour and egg white, while Stef used one with less egg white and more powder sugar. So I wanted to compare which one suits me and our oven better – the lavender ones (the white ones) are made with Stef’s recipe and the rose ones (the pink ones) with mine. I think I after all prefer Stef’s recipe, it seems to suit our not-so-good-quality oven in our rental apartment. My recipe seemed to rise in the oven a bit too fast, which resulted in a thin crust and a bit of a hollow inside. This might be avoided by having the oven on 150°C and then putting it down to 140°C right after the macarons go in. Enough with the rambling, here are the recipes! My recipe is a modification of the one on Mansikkamäki (in Finnish) and Stef’s is originally from französischkochen.de (in German, I doubled the amount). Mature the egg whites by leaving them in room temperature for a day or two. You should do that with four eggs (one more than in the recipe), because a bit evaporates. Mix the almond flour and the powder sugar together. If your almond flour is somewhat coarse like ours was, you should make it finer in a food processor (mix an equal amount of sugar and flour, otherwise the almond flour will turn into butter). Sieve the mixture to get rid of any clumps. Beat the egg whites until they start getting a bit foamy. Add the food colouring and the flavouring. Also add the sugar one spoonful at a time while beating the egg whites. Whisk until the foam is thick and glossy and you can put the bowl upside down without it dripping. It needs to be really dense, but be careful not to overbeat it. I’ve heard copper or ceramic bowls work better with egg whites, but normal plastic ones are okay. Fold the almond and powder sugar gently with a silicone scraper into the egg white foam. Don’t put it all in at once, but a third at a time. Put the mixture in a piping bag and prepare the tray with the baking paper. Hold the piping bag vertically to the tray. Keep it still while squeezing the dough into about 2 cm little buttons. To get rid of the bubbles in the dough, drop the tray from 20 cm height onto the table. Don’t be scared of the noise! This makes the macarons more smooth. Let them rest for half an hour. They should get a matte surface in this time. Put the macarons in the oven for 13 minutes. 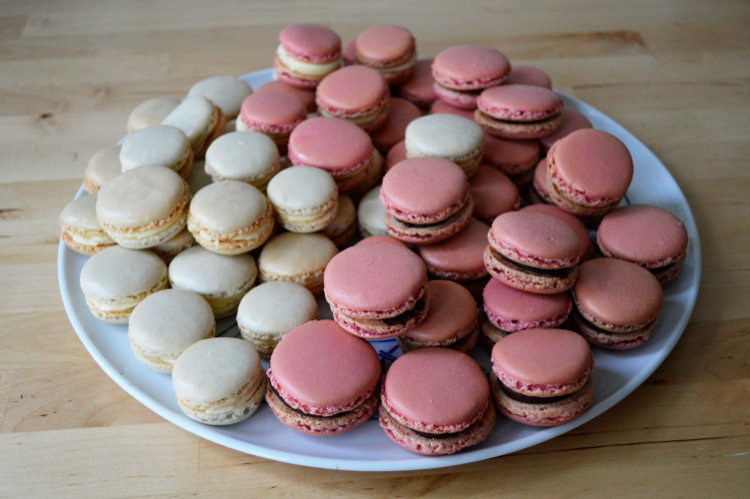 Take the baking paper off the hot tray, but leave the macarons on the paper for 10 minutes. This way they will not stick to the paper and won’t break once you take them off. 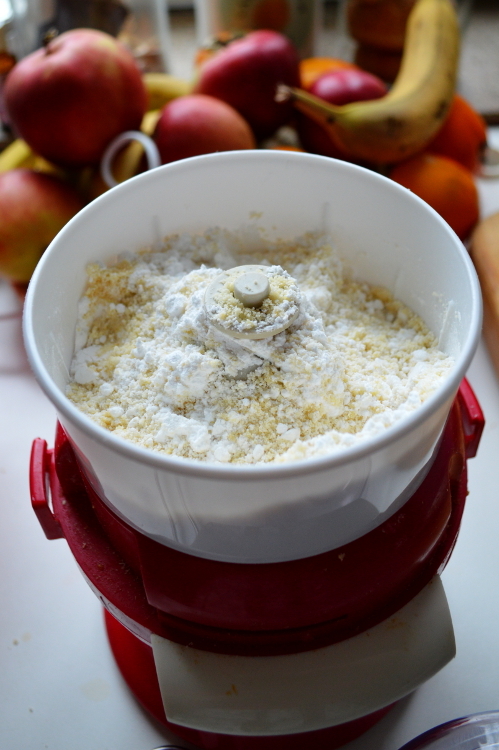 Mix the almond flour and the powder sugar together and blend it in a food processor. The bought almond flour is usually still too coarse and blending it together with the sugar will prevent it from becoming almond butter. Sieve it through a fine strainer to get rid of any clumps. Beat the egg whites. Once they start getting foamy, add the sugar and the colouring. Don’t use liquid colours! When the eggs are beaten you can add 1/3 of the almond/sugar mixture at a time. Use a wooden spoon or a plastic/silicone scraper and fold the mixture slowly into the dough. When everything is mixed, add the next part until all the almond flour is incorporated. 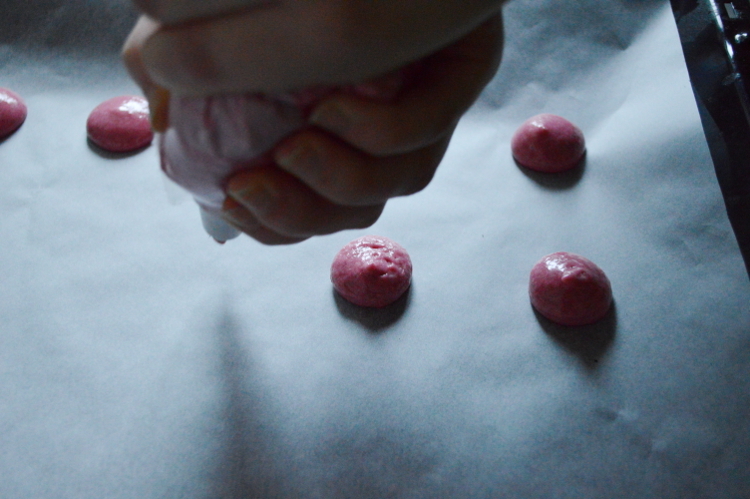 Prepare a baking sheet and form little 2 cm macaron buttons with a piping bag. Drop the tray from 20 cm height to get rid of the air bubbles in the dough. Let them rest for 15 – 20 minutes. 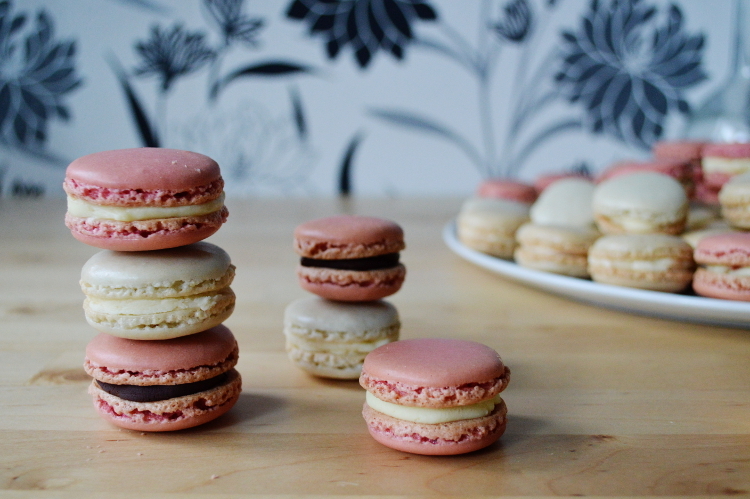 The hats need to develop a little crust so the macarons will have nice little feet later. 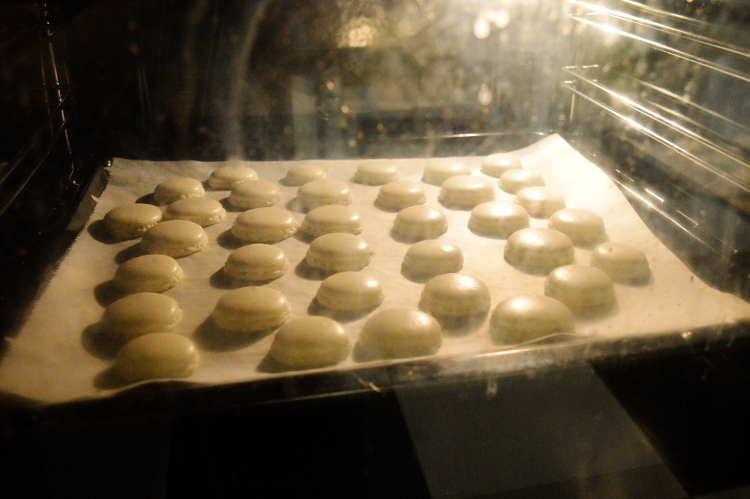 Put the macarons in the oven, putting the temperature down to 140°C and bake them for 15 minutes. After taking them out, immediately take the sheet with the macarons off the hot tray. After 10 minutes of resting, you should be able to take them off easily. Whisk the butter (around 75 – 100 g of butter should be enough) and sieve in powder sugar until it has a soft but firm texture. If it’s too soft, add more sugar. Add honey and lavender to your taste. Be careful with the lavender, a tiny drop already has a lot of flavour! If you keep the buttercream in the fridge, it might get too firm for piping. Leave it in room temperature for a bit before you intend to use it. I made the rose sirup the previous summer from fresh rose petals. Unfortunately I didn’t write the recipe down but a normal sugar sirup mixed with rose water or essence should be the same. To make the ganache, heat the cream in a kettle to boiling point. Take it off the heat and put the previously cut chocolate in. At this point you can add some salt and powder sugar in the dark chocolate ganache, to cut back the bitterness. Stir until everything is melted and smooth. 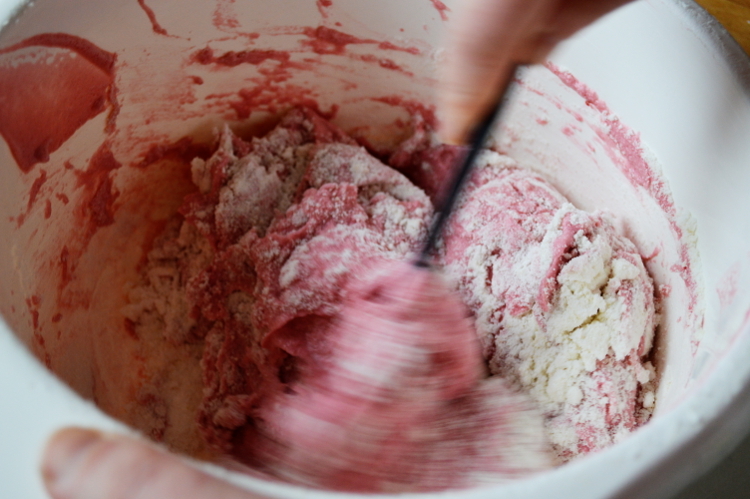 Mix it with a hand blender to make it more fluffy; be careful not to put too much air into it. Let it cool down in the fridge for two hours or even overnight. If you use it the next day it will be really stiff. You can take it out earlier so it softens up in room temperature or you can put it in the microwave for just a couple of seconds. 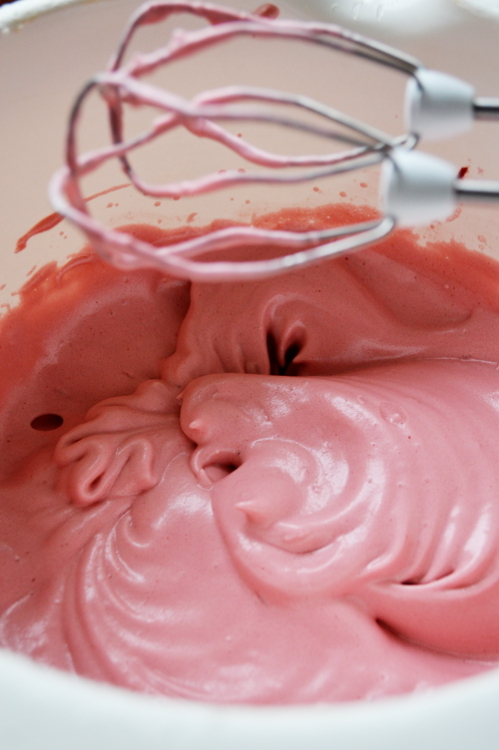 Whip it with the mixer until it gets a bit lighter in colour and a bit more creamy. Don’t overbeat it or the cream will get clumpy. 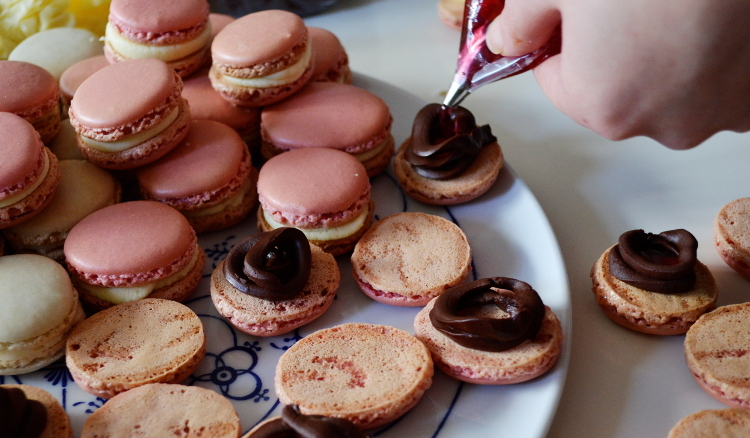 Pipe a ganache ring onto the macaron and pour some sirup in the middle. If you have too much ganache, you can just freeze it and use it later. 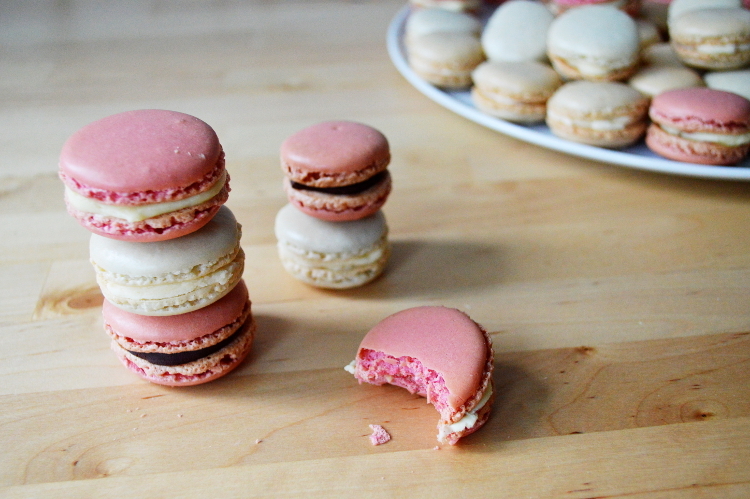 You can also freeze the macaron shells and even already the filled ones. The buttercream ones need to defrost a bit in room temperature before you can eat them. These macarons just look SO perfect. Loving the sound of that lavender buttercream especially.